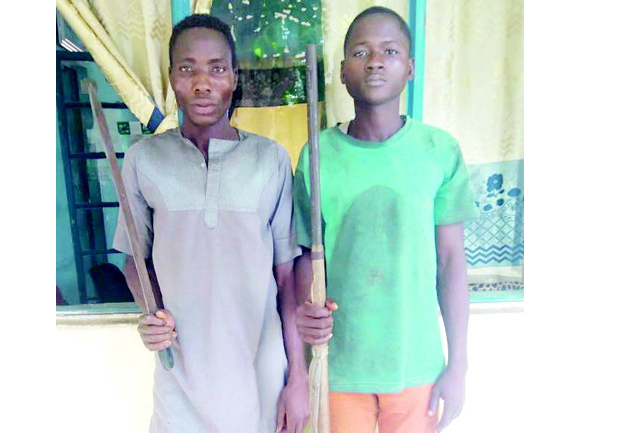 Operatives of the Niger State Police Command have arrested two suspected robbers in Tunga New Bussa in the Borgu Local Government Area of the state. The suspects, Isah Kabiru, 22, and Abdullahi Musa, 30, were apprehended after they attacked and inflicted injuries on one Gado Aliyu in his house for refusing to give them money. It was learnt that one of the suspects fired shot at and inflicted injuries on Aliyu who subsequently over-powered and disarmed his attackers. “God knows, I was actually looking for money from him to settle some bills, I didn’t have the intention to pull the trigger on him; it was accidental,” the suspect claimed. He expressed regrets over his action and begged the police for forgiveness, and promised never to get involved in crime again if freed. The Command’s Public Relations Officer, Muhammad Abubakar, said that the operatives recovered from the suspects, one dane gun and a cutlass.